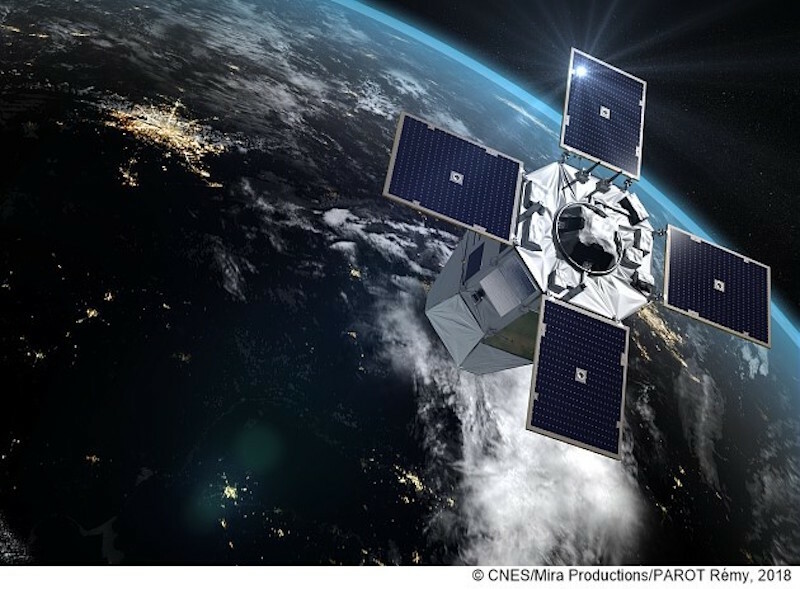 French Armed Forces Minister Florence Parly welcomes the successful launch of the CSO-1 (Optical Space Component) military observation satellite. CSO-1 was put into orbit on Wednesday 19 December 2018 from the Guiana Space Center at 18:38 Paris time. Observing the launch by videoconference, the Minister wished to thank all the teams who contributed to its success. Florence Parly also emphasized the importance of CSO, which is a major program for France’s strategic autonomy, intelligence capability and the conduct of military operations. This launch marks the beginning of the renewal of France’s entire defense space capabilities. This renewal will take place during the period of the 2019-2025 military programming law, in the fields of observation, communications and electromagnetic intelligence satellites. The CSO constellation, which will comprise three satellites, inaugurates the new generation of military observation satellites which will be completely deployed by 2021, replacing the Helios 2 satellites currently in service. CSO brings unparalleled imaging quality to Europe, allowing defense staffs access to a greater level of detail and a significant added-value for intelligence and targeting activities. CSO is also a state-of-the-art system offering users, in a single overhead pass, more images of the same geographical area. Finally, its reactivity capabilities allow it to better adapt to the operational tempo. The CSO project, developed within a national framework within the MUSIS program (Multinational Space-based Imaging System), is resolutely open to European partnerships through bilateral agreements, and Germany, Sweden and Belgium have already joined the CSO community via cooperation agreements. Agreements with other European countries are under discussion. The Directorate General of Armaments (DGA) is responsible for the conduct of the MUSIS program, through an integrated team comprising the Joint Command of the space of the General Staff of the Armed Forces. DGA itself is overall coordinator of the user ground segments, as well as for all aspects related to the establishment of cooperation partnerships. DGA has delegated to the National Center for Space Studies (CNES), the project management for the production and launch of the CSO satellites, as well as for the realization of the mission ground segment. The project management of the components of the MUSIS system involves Airbus Defense & Space, Thales Alenia Space, Thales Services, Cap Gemini and Arianespace. On Wednesday December 19, Soyuz accomplished a flawless launch from the Guiana Space Centre (CSG), Europe’s spaceport in Kourou, placing the CSO-1 security and defence Earth observation satellite into Sun-synchronous orbit for the Ministry of Armed Forces. The launch marked Soyuz’s 20th straight success from the CSG since 2011. As the successor to the Helios 1 and Helios 2 systems, the CSO (Composante Spatiale Optique) optical space component will meet France and Europe’s operational needs in the fields of intelligence, global strategic monitoring, geographic intelligence and support. With a launch mass of 3,565 kg, CSO-1 is the first in a constellation of three identical satellites in different-altitude polar orbits designed for reconnaissance and identification missions. CSO-1 was placed into an 800-km orbit from where it will acquire very-high-resolution day/night, clear-weather imagery in the visible and infrared in a range of viewing modes to serve a maximum of operational needs. The satellite has an expected lifetime of 10 years. CNES teams across the agency were called into action for this programme. In particular, teams at the Toulouse Space Centre have been tasked with design and oversight responsibility for the system with the French defence procurement agency DGA for the last 15 years. As soon as the satellite separated from its launcher, these teams took control to check that all systems were functioning correctly and to closely monitor the first onboard systems as they were powered up. Once everything has been validated, other CNES teams will take over operations to ensure the satellite is operating as planned, calibrate its instrument, establish tasking plans and define orbital manoeuvres. On the occasion of this launch, CNES President Jean-Yves Le Gall commented: “This 20th straight success for Soyuz from the Guiana Space Centre is a great source of satisfaction. The orbiting of CSO-1 shows once again how CNES is working effectively with the Ministry of Armed Forces to develop and operate its space systems. Today, our four field centres are centre stage: Head Office liaising with the armed forces, the CST for the satellite, and DLA and the CSG for its launch, so I would like to congratulate all of our people for that. KOUROU, French Guiana --- The first of the CSO (Composante Spatiale Optique, or Optical Space Component) Earth observation satellites for the French Armed Forces has been successfully launched on a Soyuz launcher from the Kourou European Spaceport in French Guyana. CSO will provide very high-resolution geo information intelligence to the French Armed Forces to its partners Germany, Belgium and Sweden. The CSO satellites are equipped with a very agile pointing system and are controlled via a secure ground control operations centre. As prime contractor for the CSO satellites programme, Airbus has provided the agile platform and avionics, and was also responsible for the integration work, testing and delivery of the satellites to CNES. Thales Alenia Space provided Airbus with the very-high resolution optical instrument. Airbus teams will also continue leading the User Ground Segment operations, as they do currently with operating legacy programmes (Helios, Pleiades, SAR-Lupe, Cosmo-Skymed). Airbus was awarded the CSO contract at the end of 2010, by CNES, the French space agency acting on behalf of DGA, the French Defence Procurement Agency. The contract included an option for a third satellite, which was activated after Germany joined the programme in 2015. “Thanks to our enduring expertise and close partnership with the French MoD since the beginning of the French Space adventure, as well as the tremendous support across industry and partners, especially Thales Alenia Space, we did it! Today, we are able and extremely proud to provide the most modern and efficient observation capability for the safety of our citizens and the sovereignty and independence of France and Europe. CSO is indeed a big step up in terms of resolution, complexity, safety of transmission, reliability and availability: only a couple of other nations can claim such a capability,” said Nicolas Chamussy, Head of Airbus Space Systems. The satellite's tremendous agility and stability enable it to quickly provide users with extremely high-quality images from the Thales Alenia Space instrument, even for the most complex acquisition schedules. Airbus has made use of the latest generation of gyroscopic actuators, fibre optic gyroscopes, on-board electronics and control software to optimise weight and inertia and significantly increase the pointing speed. CANNES --- The CSO-1 military observation satellite was successfully launched today by Arianespace, using a Soyuz rocket from the Europe’s Spaceport in French Guiana. Developed for the French Ministry for the Armed Forces by French space agency CNES, delegated as contracting authority by French defense procurement agency DGA, it was built by Airbus Defence and Space, and features a very-high-resolution optical observation instrument built by Thales Alenia Space. CSO is a military observation program comprising three satellites in Sun-synchronous orbit, deployed by France to succeed the two Helios 2 satellites operated by the armed forces for more than ten years. Providing higher resolution and day/night imaging, it will support the country’s military operations. The satellite also offers greater operational agility, and is capable of taking series of views over a given crisis zone, thus increasing the number of images acquired in a single passage. As for the six satellites in the Helios 1, Helios 2 and Pleiades families, Thales Alenia Space supplies the very-high-resolution optical instrument for the three CSO satellites, and also developed key equipment such as the solar arrays, high-speed image telemetry and the encryption and decryption module for uplinks and downlinks. The CSO instrument features major technological advances in relation to Helios 2, including new visible and infrared band detectors, more highly integrated video electronics, new cooling mechanisms for the infrared channel and a new ceramic framework for the telescope to guarantee exceptional stability. Compared with the instrument on Helios 2, the CSO instrument is 30% larger with twice as many parts for significantly higher resolution images, but development time was cut by 40%. CSO is considered the largest and most complex “space camera” ever developed in Europe. It can take ultra-precise images day or night, even while traveling at 25,000 kilometers per hour and at a distance of about 800 kilometers above the scenes it is shooting. “The launch of a satellite like CSO is a major event for France and our country’s defense,” said Jean Loic Galle, President and Chief Executive Officer of Thales Alenia Space. “It plays a critical role for France and our partners, who will be able to call on an even more powerful observation system, to continue and enhance the services offered by Helios 2A and 2B. We have ambitious goals for CSO, an extraordinary program indeed, and it will deliver exceptional performance.